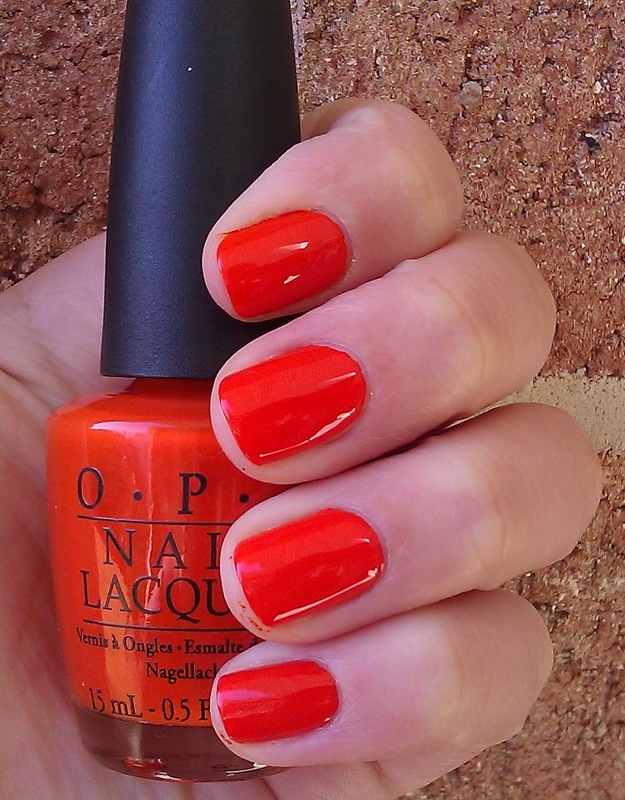 Behold, the only polish I will be keeping from the OPI Holland collection! A Roll in the Hague is a super super bright bordering-on-neon-but-not-quite orange. The formula was actually fantastic. I grew up in Holland, just outside of the Hague. I will always consider it home, and while this polish isn't exactly my normal fare, I'm going to keep it and love it a.) for the name and b.) because it's classic Dutch orange! I am totally wearing this during EuroCup. Totally. Love it! I almost bought this one, but held back because I thought it may be too close to Essie Vermillionaire, which I already own and adore! Any idea how the two compare? I had to get A Roll in the Hague too because I used to live in Delft and spent a lot of time in Den Haag too. I used to cycle to Den Haag for shopping on Saturdays. I also got I Have a Herring Problem, Gouda Gouda Two Shoes, Red Lights Ahead ... Where, Wooden Shoe Like to Know it and I Don't Give a Rotterdam. I am wearing the last one now and I love it! It looks like a grey with slight sparkle to it. One of my favorite reds is actually OPI Dutch Tulips, not part of the Holland collection, but an old Holland-related favorite none the less!A Roll in the Hague looks gorgeous--I'm loving orangy anything these days! I literally want everything from the Holland Collection. This is beautiful. Looks good on you! Can't wait for my own to arrive <3. When did you move away from Holland and how long did you live here? Love it! I really want this one, but I'm wondering how close it is to Essie Meet Me at Sunset. I can't find a comparison swatch anywhere. Do you have both? As Courtney mentioned above- any idea how it compares to Essie Vermillionaire? I'm guessing the OPI is a bit brighter, but I'm not sure. I haven't felt overly compelled to buy any of the Holland polishes; for some reason it's just not grabbing me! That's a really lovely shade. Looks wonderful on you. It's fantastic that you get to have a polish that reminds you of your birth place. I see several commenters thought of Essie Vermillionaire. I will have to pull up some on line swatches as I don't have it - want to see if it's close to what I can tell using my own nails in real life compared to photos on the web. 'Hague' is lasting really well too on me - it's been on 4 days now - tip wear some - I put another top coat of SV on it. I will need to take it off in a day because I have a lot of growth at the cuticle. Seems my nails are really growing fast right now - not too sure why. Superb colour! I've been trying to find an orange-enough-red, but maybe it's a red-enough-orange that I'm really after. Thank you! Have to check if we have the Holland collection in Finland. Gorgeous, and SO bright! A sure energy booster!